2 hours open bar - NO RESTRICTIONS! Discounts in shops, restaurants, etc. A STEP ABOVE OTHER BOAT PARTIES! 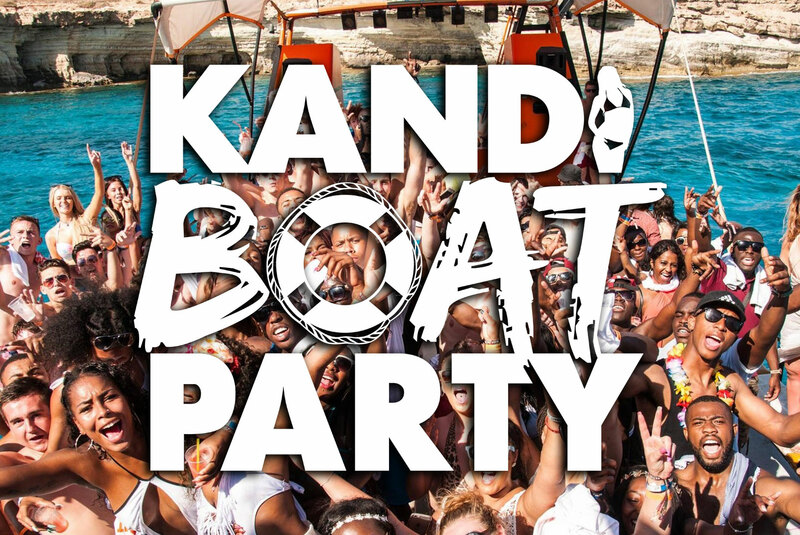 Kandi boat party is one of the leading events in Ayia Napa. A night that combines the fun of land and sea. It's not just a boat party where people get on a boat and rave and then go home, the concept goes deeper than that: the fee guarantees you a whole night package! We start at the meeting point, AYIA NAPA CIRCUS SQUARE, a spot that's easy to find. After making sure that every ticket holder is at the meeting point, you exchange your tickets to a wristband which gives you access to all the venues planned for the night. Everyone will also receive their Kandi Boat Party T-shirt. Immediately after that we proceed to the next step - food. Knowing that guests on the Kandi Boat Party come from different backgrounds we try to satisfy every taste. It starts with a Mediterranean salad, with BBQ chicken & rice. We also prepare vegetarian meals upon request when purchasing your ticket. Right after ensuring everyone has had their meal, we board the busses and go to the Ayia Napa Harbour. We board the boat for about 10 minutes and when everyone has settled and taken their place the party starts. It lasts about 3 hours and a half. The boat cruises all the way to Protaras and back. There is a 1 hour open bar policy with no restrictions. Drinks include vodka, tequila, gin, brandy, whiskey, sambuka, lagers, etc. Anyone drinks whatever they wish - nothing comes at an extra cost within the hour. Wiley, Chipmunk, Lethal B, Skepta, Shorty BBK, Maximum BBK, Cameo, Trilla, Tempa T, Bushkin, Masterace, Kaos, Ibz, Scottie B, Funky Dee, Mr M, Troopa, Mystery J, Pristine, Razor, Volatile, Napsta, Gracious K, Slick Don, Mr Play, Marcus Nasty, etc. The many genres we play include but are not limited to R&B, HipHop, House, Garage, Dubstep, Bashment, Drum&Bass. A variety of games and competitions are played, and many prizes and free giveaways are offered while aboard. Keep your wristband on after we board back at Aiya Napa harbour! The fun is not over yet - it has just started! We set shore back in the harbour around 11:30pm and you can choose to relax a bit or you can hit the square straight. You are offered special deals on drinks in a variety of bars such as: Bazaar, Havana, Ice Bar, Starskeys, Laderna. Unlike others, we carefully choose the hottest events in town and we guarantee you a VIP pass with no queue waiting or entrance fee, so at 1:30 am when the clubs open, our staff will be waiting at the pre-selected club and after verifying that you keep your wristband, you will be given a VIP pass and guide through the crowd to the clubs. But that's not all yet! You can keep partying after! You can choose any of our partners' party clubs! By showing your VIP pass given to you earlier you are guaranteed a free entrance to selected parties that end around 7 in the morning . Every Friday during the active summer season (may-october). Starts at 15:30h. 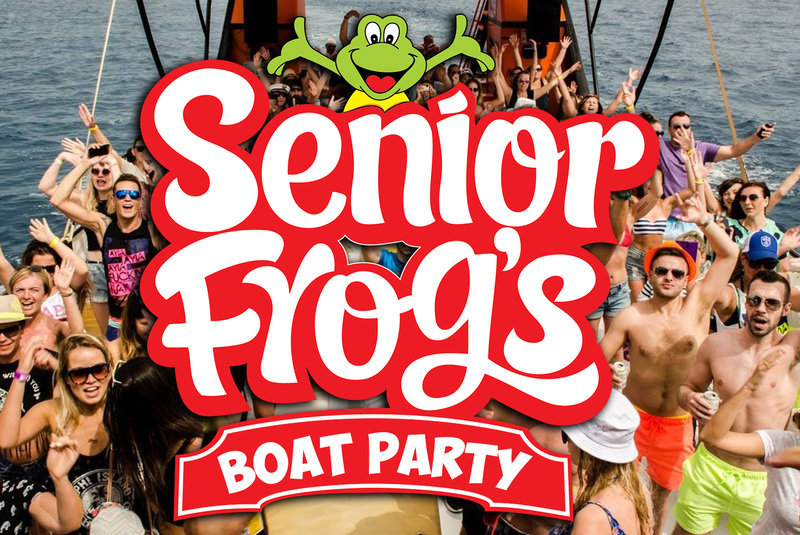 Señor Frog's familly entertainers, DJ's and MC's. A balance between men and women on every boat party, for a better party atmosphere!